For some crazy reason, I thought it would be a good idea to take my AVID students on a fieldtrip to see an ancient Greek play in the ancient Greek theater in Siracusa. You want culture? You want a unique experience? This is IT. I had been there twice (first, second) and enjoyed the experience immensely. Of course, I had been there with adults who were friends, we had great (reserved, padded) seats, and it was a civilized event. We raised enough money to buy tickets for all the high school AVID students, tutors, and teachers, over $1000. I then got lucky and teamed up with our Italian Italian teacher, Sal Iozzia (below), for this event. He liked the idea so much, he asked if his students could join us. That's how we ended up with a group of fifty-two. He purchased the tickets for us (with a great deal of hassle), the bus was approved, and all was set. In class, our very own AVID tutor Kathy Vary spent several class periods prepping the kids by reading the entire play, Agamemnon, by Aeschylus, with them. Every single kid brought in a permission slip and they actually were excited about going. Sal had told me it was "open seating," but I didn't fully understand what that was until the day before the event. It meant that NO seats were reserved--it was first come, first serve. The 2,400 year old theater seats over 10,000 people, so I didn't expect it to be full. It certainly wasn't the other times I went. We were running late in spite of starting early. Traffic and slow service at McDonald's put us on the wire to even make it in on time. We finally pulled up to the park, jumped off the bus, ran down the path and entered the theater . . . only to find it absolutely mobbed with kids--teenagers and colleges students! 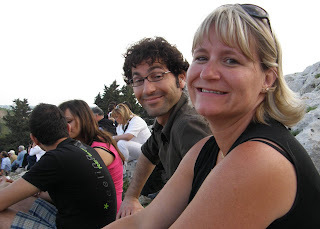 We felt the excitement and knew we were at a rock concert, a real event, the place to be! No seats were to be had, but we found places way up on the grass and rocks above the seating and everyone spread out and settled down for the performance. 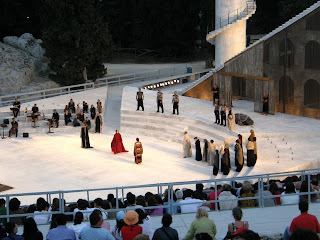 Agamemnon is one of the few remaining plays by Aeschylus. It is as old as this theater. In fact, Aeschylus himself had traveled to Sicily, which was filled with Greek colonies at the time (4th century BC), and even perished there, at Gela. The play is indeed tragic: Clytemnestra, Agamemnon's wife, has been waiting for ten years for the Trojan War to end and for her husband to return. However, it is for all the wrong reasons. Her anger at him for sacrificing their beloved daughter to the gods so he could get wind to sail to Troy has been seething for all these years. No one knows this. He finally shows up, and, to make matters worse, he has a woman "slave" with him, a war trophy, whose name is Cassandra. She just so happens to be a prophetess, and she predicts Agamemnon's and her deaths at the hand of Clytemnestra, the wife. Sure enough, they are murdered (offstage, where all violence occurs in Greek places) and then Clytemnestra and her new boyfriend, Aegisthus, leave the stage triumphantly in the end with plans to rule the Greeks together. Aegisthus, by the way, was also getting even with Agamemnon because his father was served his own children to eat by Agamenon's father (except for Aegisthus, who was an infant and spared). All in all, a very dramatic, bloody, and tragic play. 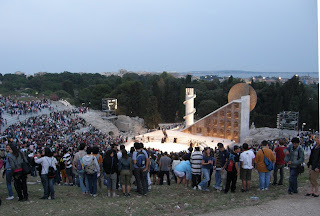 It was staged brilliantly, as it always is in Siracusa, and well-acted. In addition, there was music and chanting, which I had not seen/heard before. See more photos HERE. The kids really liked it, too, even though they were only able to understand and follow it minimally, since it is done in Italian. The biggest "adventure" came afterwards, because we stupidly had NO plan for finding the bus or even each other! Imagine all those people exiting the theater at once. Somehow, though, a miracle occurred and all fifty-two of us somehow found each other AND the bus and we all came home safely! In that mob of ten thousand, I am still amazed and grateful. Ok, so I've been there and done that . . . next year I'm going to go again, but with adults. AND, I will have reserved seats and seafood and wine afterwards! We went there on our trip to Sicily in 2006, there was no play going on, but even so, it was fantastic!!! This is pretty neat! Michael and I are really into genealogy and Michael is not only related to Agamemnon but to King Prius!!! It sounds just wonderful...I do miss the Gruneveld in Berlin though, the acoustics were fantastic!